Having a party? Or maybe you’ve just got a craving for unusual midnight snacks… or perhaps you’re having one of those trendy “midnight-snack-parties” everyone’s talking about. Either way this vegetarian-friendly (heck, even carnivores would devour this one) spinach & artichoke masterpiece will satisfy any hunger, at any time. It almost seems a shame to have to hollow out one of our mouthwatering Artisan Tuscan Boules, but put your worries aside. We’ve made this hundreds of times and not a single loaf complained. Neither did anyone enjoying it. Preheat oven to 400°F. Cut the top off the bread boule and scoop out the inside of the bread. Tear removed bread into bite-sized pieces to use for dipping. Add spinach, artichoke hearts, sour cream, mayonnaise, garlic, cream cheese and Parmesan to a medium-size bowl and stir to combine. 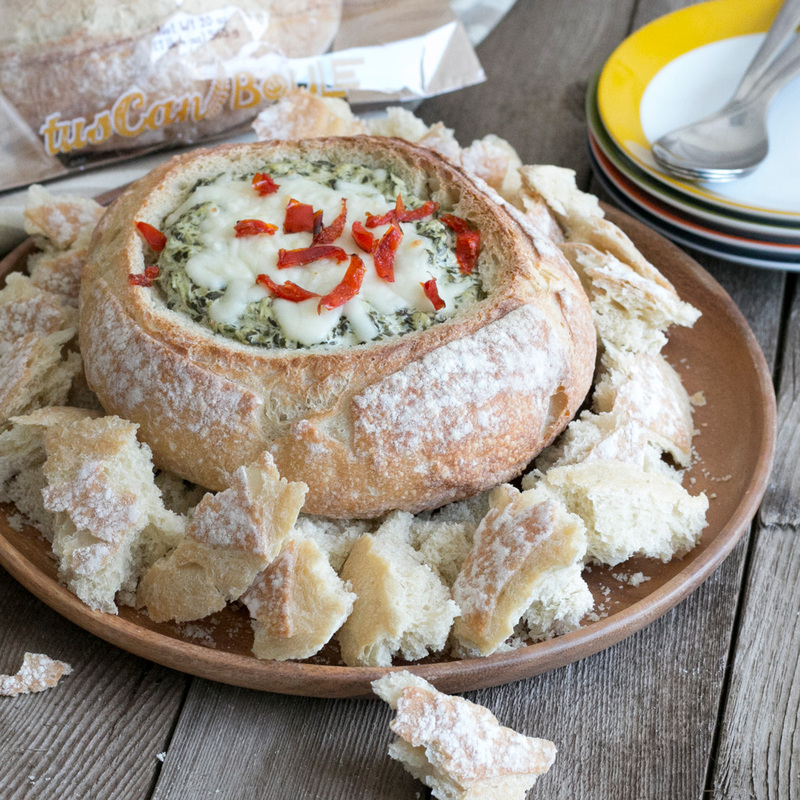 Fill empty bread boule with mixture, top with Mozzarella and roasted red pepper slices and bake until warm and bubbly (approximately 10 minutes). Tip * If pressed for time, you can use store-bought Spinach Artichoke Dip! Just skip step 2.